How do I stop Bing from localising my search results? 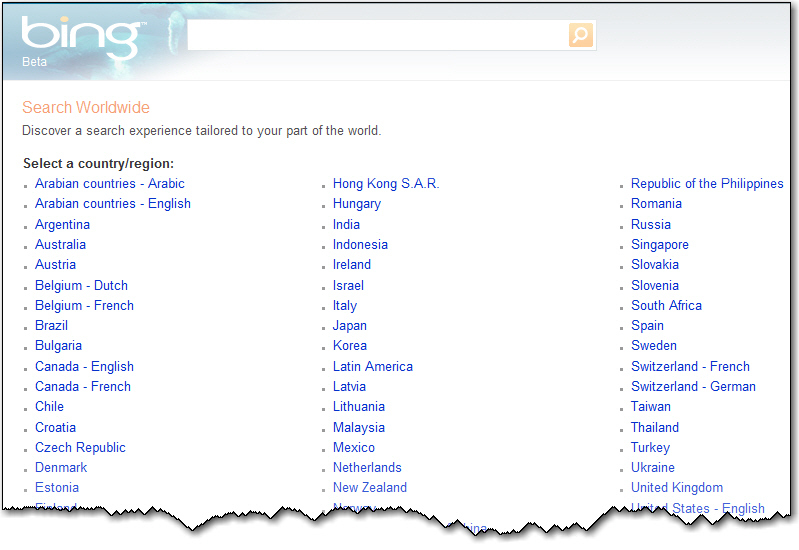 I’ve been playing with Microsoft’s new search engine: Bing and noticed that my results are very much based in the UK. I’m interested in seeing how my friends in the US would see the results of their searches. Is there any way I can change this? Once you pick your country, your search results will reflect results pertaining to the country you have selected. So if you search for “fast weight loss” and your regional settings specify the US, then you won’t be getting any results coming from the UK any more. I hope that this is what you’re after. ← Previous Previous post: How can I protect my iPod at the beach? Next → Next post: Can you recommend a quick way to copy a video on VHS to my iPod?